There are two prior newsletters that go with this theme, Listening Skills and Putting Life in Corporate Culture. The customer is always right – Macy’s and Norstrom’s made this policy famous in their employee training. To make a pleasant shopping experience in a high-end clothing store meant avoiding “selling,” especially high-pressure sales. Even if the customer was wrong and returned an item, the store made the exchange without question for a reason. Only the customer knows what is right “for them.” The opinion of the employee or the store had no value relative to the instincts driving the customer. The goal of the staff was to “ask.” That’s the only way any of us can find out what’s in the heart of another person. That is their “truth,” their paradigm, and it’s what decides what they do – not the salesman, the manager or the company. This is the “post-trust era” – if you need to sell others on corporate, political or religious initiatives just realize people are predisposed not to trust what you say or care about the challenges you face… for very good reasons. They’ve already had a bad experience… with a leader. They’ve been misled. Money and raises alone, will no longer buy hearts and loyalty. Corporate culture – What if? Instead of training a sales force to interact with customers in different departments to sell a multitude of products: What if we are training our managers in many department to adopt a multitude of our values and corporate goals. What if we treat our employees like customers and find out what’s in their hearts to help them buy into the corporate culture? What if that culture was something they wanted instead of something we sold? The employee is always right – Now, we intellectually understand this one isn’t true! However, what’s in the heart of the employee is their decision maker. They come to us with values and a culture of their own. Most individuals and companies already have a brand (in the hearts and minds of their employees and customers). It’s not what leaders think it is or what they want it to be. It is what others say it is! It’s not the company policies, procedures, or even the management direction that motivates workers. We can override their hearts to get a job done… and make oxen out of them. But if we want lions, motivated from the heart, we have to start with their values and their goals and help them make a connection with their own heart and the heart of the company. Step #1, we have to ask to find out what those dreams are. Managers are all about sharing what’s in their heart. Leaders tap into the hearts of those they lead. It’s really not deeper than showing respect. 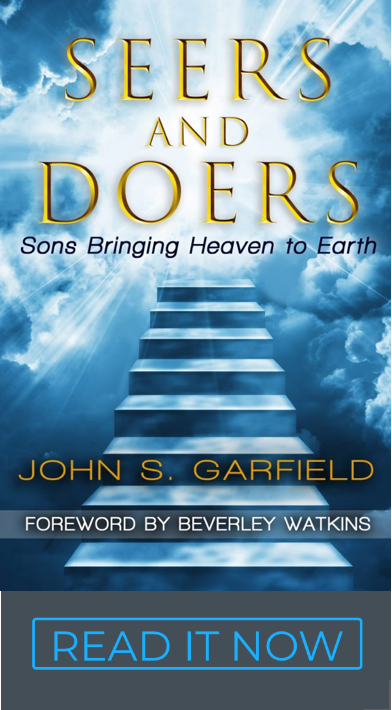 If I believe God has written in the hearts of the people I work with, I’ll be very interested in what’s in their heart. Somewhere there’s a lion in there. If I believe people are basically mindless oxen, I won’t bother to ask. They, in return, will behave like oxen… present at work, but their hearts are someplace else… and the corporate culture they work in feels heartless. Yes, but how? – Institutional culture in organizations, schools, churches and corporations is always a mix of oxen and lions. Blanket coverage of everyone at once is too impersonal to activate a lion and nearly guanteed to offend oxen because it misses hearts. Not because what we say about our heart, culture, values and goals is wrong. It’s just that we have no clue how the hearts of people hear our message, filter it, and translate it into their own truth… which, for them, is more true than our version. What we say isn’t nearly as important as what people hear. We can’t lead, manage or even relate to people without knowing their version of the “facts.” Most managers are far too insecure to even ask what’s in the hearts of their staff, because they know it would be awkward and they are ill-equipped to deal with Pandora’s Box. Culture is changed when we really know what’s in the hearts of fellow managers and employees. That happens at every level. The interview – the best opportunity to make a good impression is the first one. Asking prospective employee about their dream, their values and their goals will tell you much more about their fit than you sharing the company dream, values and goals. Shop for people who have the discipline of oxen to get a job done, but the motivation of a lion to lead from their own heart and out of their own vision. Realize all employees eventually leave: Lions leave for promotions and create space for the next lion. Oxen leave in frustration, destroying the culture on the way out. The assignment – Opportunities for new assignments or new job positions are another opportunity to hear what’s in the heart of an existing employee. If you have taken the time to hear their heart and it turns out to be a fit, you have a running start at releasing a lion. The relationship – Leaders lead lions through relationships – knowing what’s in co-workers hearts both professionally and personally. Managers pass on instructions at an intellectual level, creating and sustaining a culture of oxen. Both lions and oxen are contagious and will create more of the same throughout the organizational culture. 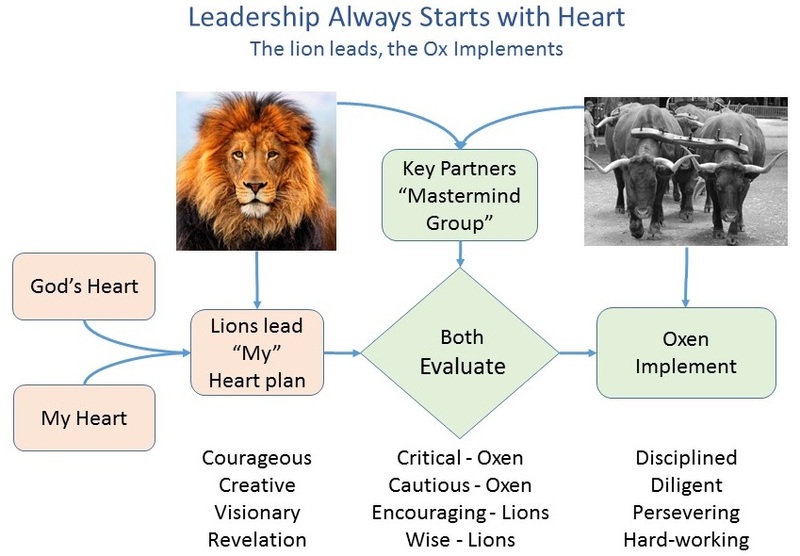 Leaders find the lions (the 20% who are internally motivated) and find out what’s already in their hearts. Just asking goes a long way toward respect and relationship. The organization – Guess what! Oxen do a very poor job of leading lions. If our first line and middle managers are just oxen carrying out assignments, procedures and policy, we can be assured all the lions we do have are frustrated. Heart synergism – When I understand what’s really in another’s heart, I can find the overlap with my own dream and the corporate vision. That’s when the magic starts. That’s how Kingdom works… from the heart. We are all motivated, productive and positive when we’re aligned with our own hearts. The most important observation is that how we lead and whether we create oxen or lions is determined by our beliefs about people. God wrote something precious in their hearts. When I accept that premise, I relate to people differently. I’m more prone to start with their lion (their dream and goals). The other choice is to pound my values and goals into them from the top down, miss hearts and create a culture of oxen. Observation #2 – When we do create a culture of lions, they will come and ask you what your dream is. And when they find out, they will add a new wing onto your dream that you never thought of. That’s what lions do… courageously create, initiate, and innovate. Observation #3 – Leading lions is much easier than leading oxen once the culture is in place. The contagion starts when leaders start listening to hearts instead of just words. It starts when leaders ask questions to drawn those hearts out in a safe and respectful environment. It starts when leaders care enough about their people to simply ask… At the deepest level people care about how much you care… much more than what you know, what you want, or what your goals are. Real leaders have always had an inspirational ingredient that touches hearts. They are champions of what is already in the hearts of those they lead. Why ask? – The widgets our company creates may have a direct connection to an exciting Kingdom purpose. We should ask the Lord to show it to us. Regardless of the company widgets, purpose and vision, we should still have a dream to release the hearts of our staff. That is always high on God’s list. He loves people and so should we. Part of every corporate vision is cultivating the hearts of their staff – it’s a Kingdom value. CEO’s are usually very well-meaning people. Corporations don’t have to be heartless giants designed to meet contracts and generate money alone. Kingdom is connecting companies, leaders and staff with the Kingdom purpose that already resides in their hearts. When it happens, the culture feels like love and fruitfulness at the same time. Lions are good for the bottom line… in the spirit and in the natural. Putting Kingdom value on people and leveraging the motivation in their hearts is good for morale and good for your brand. PS: You will occasionally find an abusive or dishonest customer and an employee who won’t turn the corner. You simply have to remove them or fire them. The sooner you do, the happier everyone will be. Not everyone has a pure heart and a leader knows what to do about it. It is often the case that some fraction of customers and staff just belong somewhere else by design. We do them a favor by helping them find their new home.